Load up DVDDecrytper and select "Mode" menu, then insure that you're in "File" mode as depicted below. 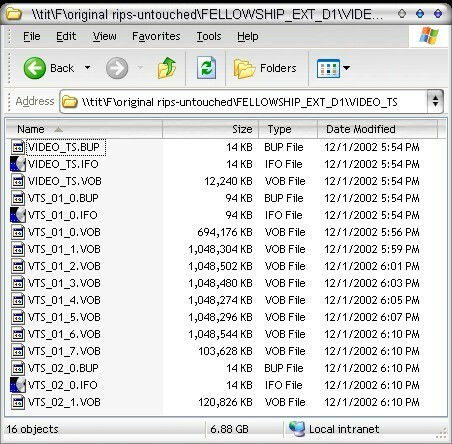 DVD Decrypter is smart and guesses which of the VOBs is the main movie. Obviously, it is the title set 01 (VTS_01_x.VoB). That really doesn't matter because to make a true 1:1 copy, we'll need all the files. So do a ctrl-a or manually select all. Change your destination dir if you wish and insure the drive you are using indeed has ~8 gig free. After that, hit the "DVD" button to start the ripping process. After 5-90 minutes (depending on the rip speed of your DVDROM) you'll get the report indicating the rip process is complete. Okay, so what was on the DVD? And what do they mean? If you're ever in doubt about what a title set contains, simply load the associated IFO file in IFOEDIT and hit "Play DVD" to see what each does.